Context-sensitive help can be found within the admin dashboard of your blog by clicking the “Help” button in the upper right-hand corner. If you would rather publish to your site from a third-party blogging tool, head over here for more information. Full documentation can be found in the WordPress Codex. You can get community support by joining the UVM Blogging mailing list. Faculty can get more detailed support from The Center for Teaching & Learning. I’m a PhD student in the nutrition department starting a study in the fall and I’d like to have a blog for the study. I was wondering if I could get some help starting one? Any UVM affiliate can have a blog (or many separate blogs, if you want) on blog.uvm.edu. All you have to do is click the “Log in” button up at the top, log in with your UVM NetID & password, and then from the home page, click on “Create a blog”. Is there any way I can embed videos on posts? Can you point me to documentation for it? Sure, you can easily embed videos into your WordPress posts. Copy the URL of the page with the video you want, and paste it onto a line by itself in your post. When you publish your post, WordPress will display the video where you put its URL. WordPress has some helpful tips like this in its Help system, which is useful but a bit too subtle to find. In the upper right corner of most screens is a Help button. Clicking this button will show help about the page you are looking at. Hi there! I’m trying to add my posts to Categories, but I don’t see where that’s possible. In other WordPress installations, the Categories menu is tied in with the Tags menu for each blog post. Where can I find it here? Recent releases of WordPress have started hiding options that might be confusing to new users, but people who want them can still turn them on. In the upper right corner of the post editing page is a “Screen Options” button. Click it, and a box will slide down containing additional posting features, including tags and categories. Thanks! That’s sorted it entirely. Could you tell us a little bit about how you are thinking of using BadgeOS? (BadgeStack basically sets up default rules for BadgeOS, which also needs to be installed.) It looks like a neat system; we would just want to make sure it could fully fit your needs on UVM Blogs without needing additional custom coding to add in logic for how you are thinking of having people achieve tasks and such. Thanks for the prompt response! We currently maintain a BadgeStack platform on a hosted site, but are interested in piloting work with the BadgeStack plugin to demonstrate to our partners how they could deploy it locally on their own WordPress sites. Our pilot would take the form of earning badges for attendance at our events (we host four large conferences and ten monthly workshops per year). Participants could earn badges for attending, presenting, and reflecting about the events. Hopefully, this would replace certificates of attendance and presentation (the current widely accepted method) and encourage sharing of resources. I can touch base with you offline if you’d like more info on the infrastructure we’re thinking, and whether it would work with UVM’s main setup. How can I get visit counts for my blog? I know some people are reading it, but I have no idea how many. We have several optional plugins available that you could enable to provide some site usage info. From your site dashboard, you should be able to find the Plugins screen from the left sidebar menu. Probably the easiest option is the “Site Stats” that are part of the JetPack plugin. In order to use this plugin, you need to sign up for a free account at wordpress.com. There are two other plugins available that connect to Google Analytics, which provides much more comprehensive data, and is also somewhat more involved to configure — not horrible, but has a number of steps. Honesty, I’m not quite sure what distinguishes the two plugins from each other, but I’m sure people who know more about Search Engine Optimization and site traffic analysis would have their preference. I hope that’s enough to get you started. If you have additional questions, feel free to send us a note. PS. Is that avatar picture of you doing some blacksmith work? 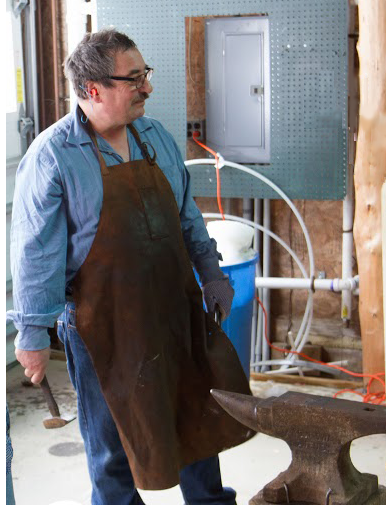 Last summer, I took a weekend blacksmithing class at the Lake Champlain Maritime Museum and had a fun time. Do you have your own forge? Thanks. I ended up using the google analytics plug in, and other than the fact that my blog has not had any visitors besides me in the last hour, all seems to be working just fine. Yes, that avatar is taken from a weekend blacksmithing workshop I attended. I had great fun — nothing better than pounding on hot metal with a hammer, but I am mainly a woodworker, and I really don’t have the time, space, or energy to pursue it as a hobby. I’m trying to retrieve some video from the UVM Media Manager to embed in a blog post, but the embed codes from the Media Manager don’t seem to be working. At least, they and the links are working differently than YouTube with WordPress. Does anyone know if this is a theme-specific issue? Or is the Media Manager just blanketly non-compatible with WordPress? Are we able to invite non-UVM affiliates to be authors on our blogs? If I post my own pictures to a blog I’m creating do they become property of UVM? UVM’s intellectual property policy covers such things. Generally, if created works are unrelated to a university job or classwork, they’re yours regardless, but things possibly get murky otherwise. It’s worth looking through to be aware of the edge cases. Questions about specific examples would probably have to be asked of the General Counsel’s office. I am interested in installing a theme that is not among the list of ‘available themes’ on my Dashboard (appearance>themes). Can this be done? Thanks. In a multi-site WordPress setup like ours (or even WordPress.com, for that matter), site owners need to pick from themes the admins have installed. If there’s another you’d like to see added, just let SAA know and we’ll take a look. Most of our themes and plugins have been installed by request. The “search” button and the pages 2-16 button on the http://blog.uvm.edu/blogs does not apper to be active. How else can a view the entirety of the list of all UVM blogs?